“strangers” like jazz and fusion that peppered these three works, making them a not very comfortable listen for the more scholastic fraction of the fanbase who may have been pulled off by the album reviewed here the most as this is the least death metal-fixated offering of the three. In fact, there isn’t much death metal here if we exclude Mameli’s aggressive, weirdly echoing vocals; thrash has been brought back although its role isn’t that prominent, either, reminiscent of its service on the late-80’s Voivod instalments, and especially on DBC’s trippy hallucinogenic “Universe”. The effort here recalls the latter work in more ways than one, but there’s another album that has to be mentioned here, the one that first introduced the jazz/fusion elements into the metal template, and the one to which all Cynics, Atheists, etc. owe a lot, Sieges Even’s “Steps” (the album-title here may also be a more or less covert reference to it). 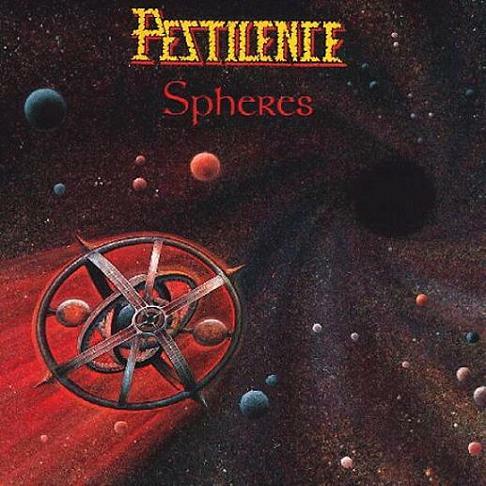 The Pestilence recording comes very close to its far-reaching grandiosity although again it doesn’t completely avoid the “thrash” tag like that one, what with the surreal guitarisms ala Mekong Delta and Target detected on “Mind Reflections”, a most disorienting inauguration with the outlandish riffage creeping minimalistically, creating alien dystopian atmosphere quite akin to the one on the mentioned DBC work as well. Although a couple of cuts (“Multiple Beings”, “The Level of Perception”) later follow this “thrash for the new millennium and beyond’s generation” approach, there’s still this pressing deathy urgency to be detected on the trippy “Soul Search”, an expansive template that may have been heard more than just a few times by contemporary “beyond death” outfits like Obliteration, Morbus Chron, Tribulation, Beheaded Zombie, etc. However, it’s on the more delineated from the pure thrash/death metal formula moments where this opus really comes outside the box in marvellous ways, like on the psychedelic dreamy Pink Floyd-ian “Personal Energy” and the more dynamic, but equally as spacey and abstract title-track, plus the several short ambient all-instrumental interludes the latter sounding way more idyllic than the ones from “Testimony of the Ancients”. Although the band don’t dwell on these mind-expanding tunes too much here, they invariably leave their trace throughout this opus with “Changing Perspectives” being a particularly impressive jarring, keyboard-peppered schizoid thrasher, total Nomicon and Mekong Delta-sque insanity; and “Demise of Time” indulging in overlapping labyrinthine spirals, with great twisted leads circling around adding to the extra-terrestrial, boundary-transcending listening experience with genre categorizations becoming ultimately redundant by the end of this superb, from-out-of-space visitation.